In the years since the tragic shooting at Sandy Hook School on December 14, 2012, many have been working to improve school safety. School communities across the country are reexamining measures, plans, and procedures in place to better prevent, prepare for, and respond to emergencies. As part of these efforts, schools nationwide are looking for tools that help. Many are looking to the growing number of apps and software technologies now available to assist school emergency preparedness. It is not surprising that this trend has emerged, with smart phone sales exceeding 1.2 billion units in 2014 according to GFK. Companies like CrisisGo, Guardly Corp., Guard911, Punch Alert Technologies, Elerts, Livesafe, and NaviGate PreparedTM, among others, have developed software that school communities can use to better prepare for and communicate during emergencies. The technology integrated in these tools is not only supportive of the school community during a crisis, but also to first response teams. With interactive maps and floor plans available in many programs, first responders can quickly locate entry points and reduce the time it takes to respond to an emergency. As well, school communities can train staff and conduct drills using app technology. First responders can use apps to readily access emergency information, practice and refine procedures with students and staff, and reunify a school community following practice or true emergency. Many school districts have started to use app technology for emergency preparedness and practice. Lake Forest Schools in Illinois is implementing an app to serve as a panic button for classroom teachers. Davies County Schools in Indiana now uses an app to alert first responders of emergencies, and may expand their app use to communicate internally as well. Royalton Schools in Minnesota is using an app to replace its 40-page crisis management plan. One concern some community members have expressed with the new technology is protecting private and critical information like student attendance and schedules. In counties like Lake Forest, school board members have decided that the privacy risk is worth the security trade off. Several app companies now offer government level security protection of critical information with their technology. 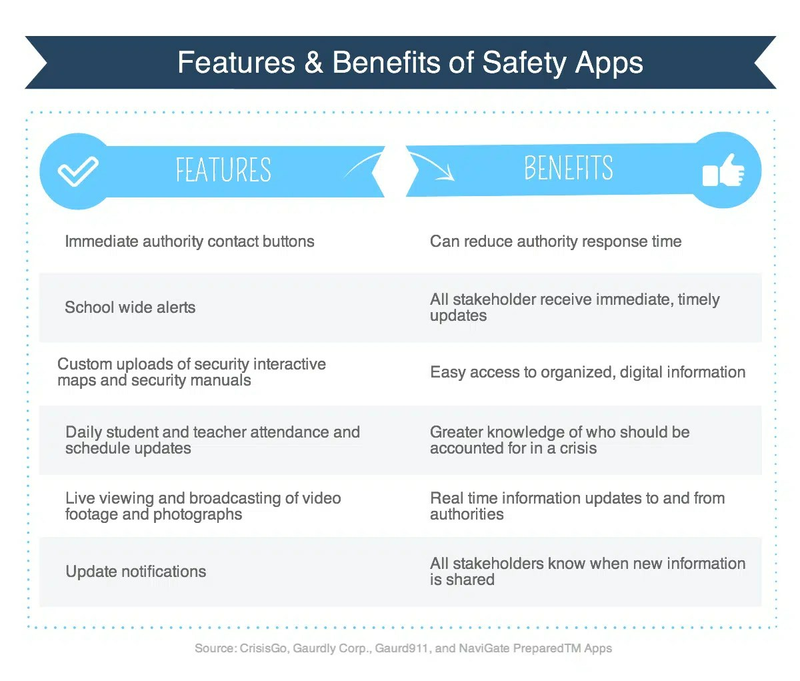 As exciting as these innovations are, it is important to consider that tools and technology are only part of a comprehensive approach to school safety. Successful school safety requires education, training, innovation, and collaboration to keep students and staff safe! This was a really wonderful post. Thank you for supplying these details. Hi my loved one! I wish to say that this post is amazing, nice written and include almost all significant infos. I’d like to see more posts like this . I very delighted to find this site on bing, just what I was looking for : D besides bookmarked. Most of what you state happens to be astonishingly appropriate and it makes me wonder the reason why I hadn’t looked at this in this light before. Your article really did switch the light on for me as far as this particular subject matter goes. Nevertheless there is actually just one position I am not really too cozy with and while I make an effort to reconcile that with the central idea of the position, allow me observe exactly what the rest of the visitors have to say.Very well done. I do not even know how I ended up here, but I thought this post was great. 😉 Cheers! Some really superb info , Sword lily I found this. “What we want is to see the child in pursuit of knowledge, and not knowledge in pursuit of the child.” by George Bernard Shaw.